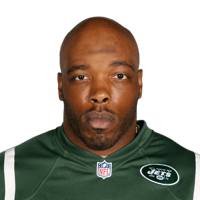 Published: Nov. 12, 2012 at 03:32 a.m.
(15:00) (Shotgun) M.Lynch left guard to NYJ 37 for 3 yards (M.Wilkerson). FUMBLES (M.Wilkerson), RECOVERED by NYJ-C.Pace at NYJ 37. C.Pace to NYJ 37 for no gain (M.Lynch). Published: Dec. 4, 2011 at 05:59 p.m.
(4:33) (Shotgun) R.Grossman sacked at WAS 11 for -9 yards (A.Maybin). FUMBLES (A.Maybin), RECOVERED by NYJ-C.Pace at WAS 9. C.Pace to WAS 9 for no gain (W.Montgomery). Published: Dec. 4, 2011 at 04:21 p.m.
Redskins QB Rex Grossman is sacked by Jets LB Calvin Pace, who recovers the loose ball to set up a Jets TD. Published: Nov. 17, 2011 at 10:18 p.m.
(:32) (Shotgun) W.McGahee left tackle to DEN 47 for no gain (C.Pace). FUMBLES (C.Pace), RECOVERED by NYJ-B.Scott at DEN 44. B.Scott to DEN 35 for 9 yards (V.Green).